"Diagnosaurus provides differential diagnoses (DDx) of symptoms, signs, and diseases. By using the various indexes, you can choose to view entries by organ system, or select to view the list of symptoms only, the list of diseases only, or all of the entries. For example, if you wish to review the causes of a patient's chief complaint, simply select the symptom or sign from the alphabetical listing. If you have made a diagnosis and wonder what other disorders to consider, select your diagnosis from the list to see its DDx." 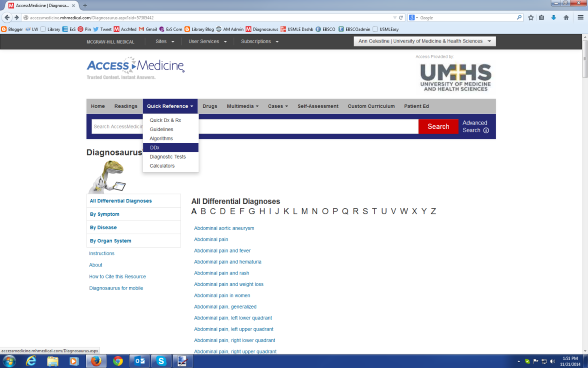 Access from the Anne Ross Library Home page by clicking on 'AccessMedicine' and logging in using the UMHS generic login, and/or then your personal UMHS MyAccess login. "In medicine, the terms "differential diagnosis" and "etiology" often overlap. They are sometimes distinct and sometimes synonymous. In Diagnosaurus, "DDx" is generally used when either term can apply. However, many entries have both an etiology list and a DDx. In these cases, the etiologies are the possible causes of the condition, while the DDx is the list of alternative diagnoses. For consistency, etiology is always listed before DDx. A few entries also have a list of "associated conditions" or "types." Note that every entry is linked to related entries by way of the "See Related DDx" feature. For example, while viewing the DDx of psoriasis, you may wish to see the related DDx of scaly lesions. This feature also helps label a patient's presenting syndrome and thus leads you to the best differential diagnosis. In the example above, if the rash reminds you of psoriasis, you might start with the psoriasis entry and then link to the differential diagnosis of scaly lesions."